Congratulations to Master Raymond on being selected for GB Team for the 14th European Poomse Championships in Antalya in April. Good luck from us all at LLTKD! Fancy training with a Korean Grandmaster? Well, here’s your opportunity! GM Byeong Hyung Shin, 9th Dan will be visiting England and holding a seminar on Thursday 13th April at Tiffin Sports Centre from 6-8pm. What’s happened since September ? Casting the memory back to October, Congratulations go to GM Lawrence, Master Raymond, Master Donston, Heena, Carla, Claire who all passed their Poomse Judging Course held in Kingston on 22nd October. It was a long, but enjoyable day and a great opportunity to keep up to date with the Poomse and competition rules. A week later the club supported the association’s annual All Grades Seminar. As usual it was a great day and was made more enjoyable by having a National Poomse Coach in attendance! It wasn’t long before we were back in Swanmore for the winter dan grading. Congratulations to on passing their 1st and 2nd dan gradings Shayan, Rhys, Sahil and Grand aka Mr B.
Sticking with the poomse theme, 6 LLTKD competitors managed to squeeze into the Bluewave open in Basingstoke on the 28th January. It was a first tournament for some so a great learning opportunity and for others a chance to add to their medal collection with two silvers and bronze. So pretty good going from the team. On the weekend of the 4th & 5th of March we had a clash; GM Lawrence updated his Centre Refereeing qualification while 13 members of the Kingston Uni team travelled to Worcester to represent the University in the annual University Championships. The team had a fantastic result coming 9th out of the 50 participating Universities by earning 2 bronze medals in Poomse and 3 bronze, 1 silver and 1 gold in sparring. Well done to everyone! New club, some changes… the class times are from 12 – 13:30 (an hour later than previously advertised). We’re also training downstairs in the main hall. 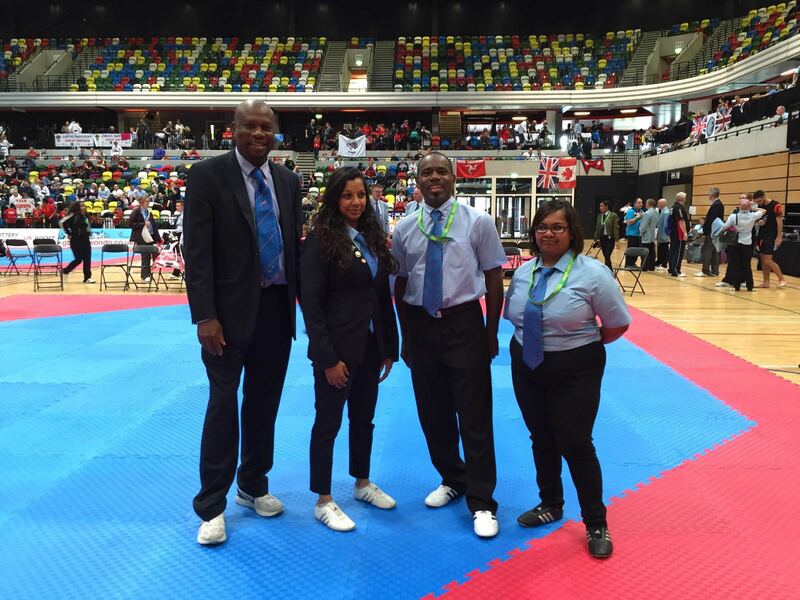 There are competitors as well  but we’re supporting the British Taekwondo National Championships with 4 Referees . 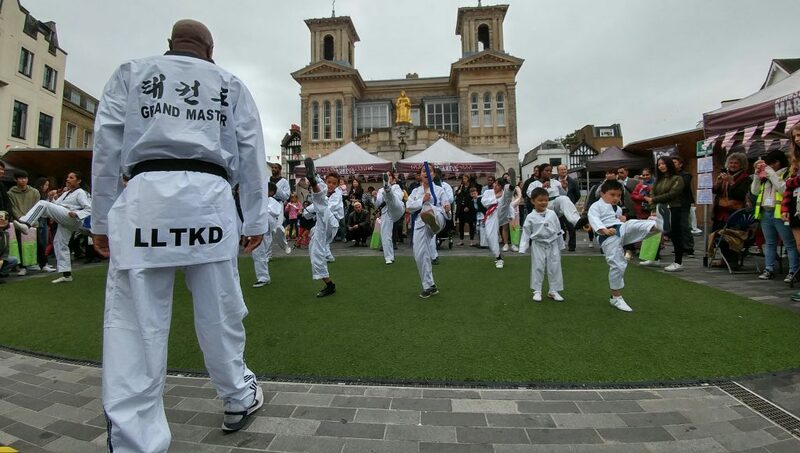 Thanks to everyone for participating and supporting at the demonstration today at Kingston market square in association with the Korean British Cultural Exchange. We had a good turn out, a lot of fun, lots of spectators and the rain held off! Next Saturday we’ll be at Tiffin Sports Centre for training between 11am and 12:30. Hope to see you there. 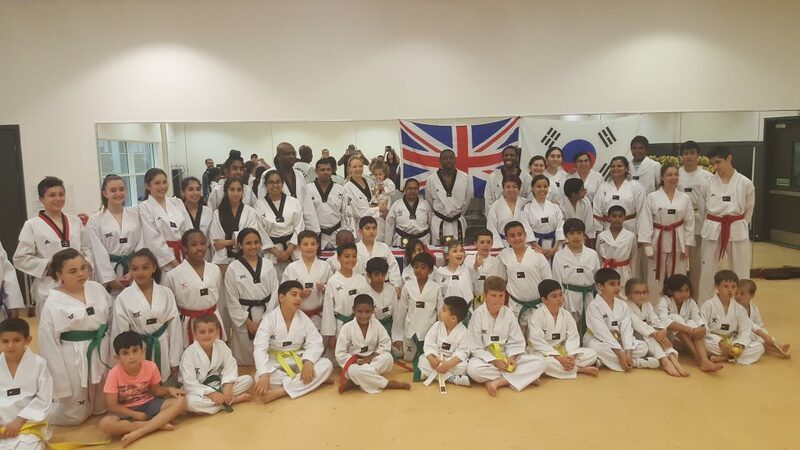 Come and support us (or participate) at the Taekwondo Demonstration at the Autumn Full Moon festival hosted by the Korean British Cultural Exchange on Saturday 17th September between 12 and 4pm. We’re pleased to announce that we will be starting a new club in Tiffin Sports Centre, Kingston running every Saturday from 11am – 12:30pm. 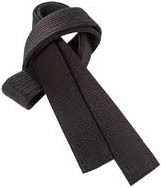 We hope to provide more sparring practice for students and utilise the mats that we have stored at the club. Do come and join us! 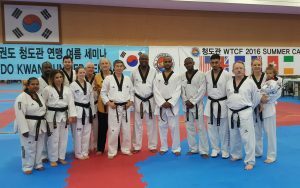 Students and Instructors from LLTKD made up a group of 15 from TCGB who completed a 3 day seminar organised by Chungdokwan Korea. 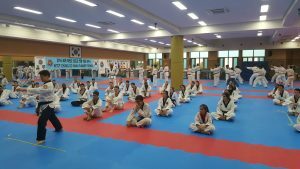 Held at the National Sports University near the Olympic Park in Seoul, attendees trained with students and instructors from the Chungdokwan groups from France to Hong King, Mexico, Singapore, the USA, Australia, Malaysia, Ireland as well as a selection of Korean instructors and students. It was an event enjoyed by all and as well as a whirlwind visit to Korea it included poomse and kyorgi training, a Chungdokwan banquet, the obligatory mountain climbing, visit to the Kukkiwon and participating in a demonstration at a model Korean village! For the last few years we’ve been invited to train at Tiger Cub TKD in Enfield. We went this year for another great session covering kyorgi techniques, poomse and breaking and a bit of impromptu demonstration of our own. It’s nice to see the student progression and see their hard work paying off.